Last week we wrote up one of our world-famous “Debate Diaries” from an appearance by Democratic gubernatorial candidates at the “Colorado Decides” series sponsored by Colorado Public Television, CBS4 Denver, KOA NewsRadio and KUNC. 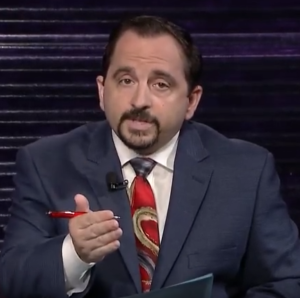 Dominic Dezzutti opens GOP debate with long explanation for absence of Walker Stapleton. 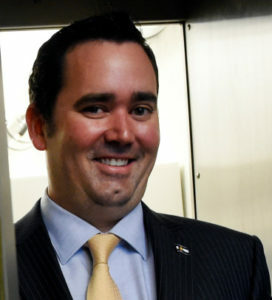 DEZZUTTI: Missing from our lineup today is State Treasurer Walker Stapleton. I feel I need to explain why Treasurer Stapleton is not here. We made our very best effort to work within Treasurer Stapleton’s very busy schedule. We offered three different dates that would allow us an opportunity to present a debate to you, the voters, within the first week of the mail-in ballots being sent out. We made that request the week after the state assemblies in April. The Stapleton campaign declined those dates but offered two dates that would have pushed our broadcast to a full 10 days after the ballots were sent out. After initially declining their offer of those two dates, eight days later I proposed two additional dates in May. After hearing no response, we decided that we would try to accommodate his schedule, and asked if the original debates they offered were still available. We were told those dates were no longer available. What is most interesting here is not that Stapleton did not appear on the “Colorado Decides” debate, but that his campaign apparently created so much ill will in declining multiple invitations. Dezzutti’s explanation for Stapleton’s absence lasted more than a minute; “Colorado Decides” was intent on making it clear that they went out of their way to accommodate Stapleton at every turn. Stapleton has participated in other debates during this election cycle, and he is still scheduled to appear at a Republican candidate debate at 9News later today. So why the absence here? First and foremost, Stapleton does not do particularly well in debate settings. His campaign knows this and thus tries to limit his exposure as much as possible. We’ve heard that Stapleton maintains a comfortable lead over his Republican opponents, though no numbers have been released publicly in recent months, so this may also be a case where Stapleton’s advisers think that there is nothing for him to gain by engaging in multiple debates. If Stapleton becomes the Republican nominee for Governor, he’s not going to be able to dismiss these events as casually as his campaign handled the “Colorado Decides” forum. Perhaps Stapleton’s campaign is more than willing to worry about that problem later. Don't you mean Wayne Stapleton? Just go with Dubya Stapleton … that way, you avoid specifics AND stress the link to the Bush clan. You love Jason Crow – how many has he attended? Can we all just agree that Walker is an incompetent lazy, disinterested slob whose only asset is his birth into a connected family? Why debate? He's taking lessons from Doug Lamborn – don't debate and risk showing how inadequate you are. Just run and accept the primary victory that is your God given right. Oh wait, that only works in El Paso County. Too bad we don't have a "live" debate thread for the debate right now on 9news' Facebook page. Yikes! Tough to listen to. Video should be posted on the 9news website later this evening.